Although honey bees are very beneficial to agriculture, they make lousy house guests. If you’re looking on our site about bees you probably have one or the other following problems. The first is you see a big ball of bees on a tree, a bush or on the side of the house all clumped together. This is known as a resting swarm. These bees will leave on their own within a couple of days. We know it can be troubling to see this but we don’t like to kill bees if it is not needed. If this resting swarm is an immediate threat to someone’s safety we will come out and do the service, If you’re seeing bees going in and out of your house, this means they have already set up a hive and the sooner you remove it the better. Bees can build honey comb very quickly and the more there is, the more damage it can cause and the more costly it will be to remove. Eliminating bees is a two step process, the first step is to do a kill, then the honeycomb removal, if needed. We can determine this when we’re out there. Bee hive/honeycomb removal needs to be bid by the technician once we see the extent of the problem. We can give you ball park prices over the phone for the kill, but with the removal we need to see it. 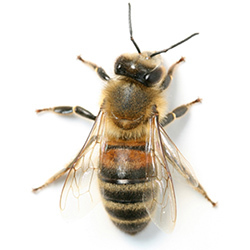 A lot of people are afraid of the Africanized Bee, which is quite a bit more aggressive than the European Honey Bee. However, sting wise they are the same as the regular honey bee. 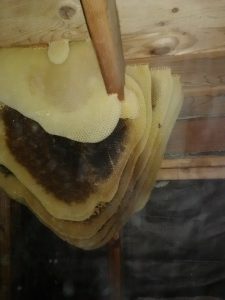 If the honeycomb is left in the walls, it will cause a great amount of damage once the honeycomb warms up and the honey begins dripping out of it. The moisture can cause fungus damage to the wood members, as well as creating mold inside the walls.